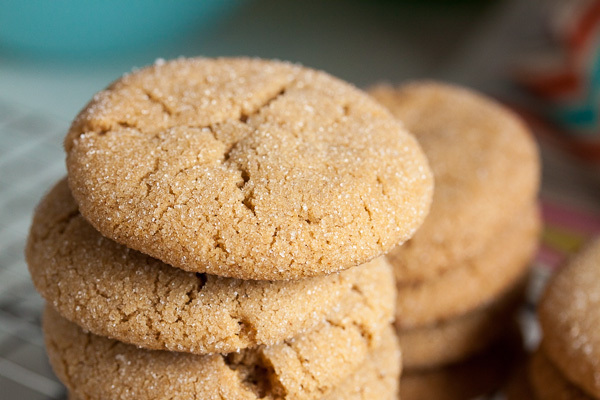 Soft Gingersnap Cookies | wanna come with? After two weeks in a row baking special requests, this week I was directionless. I had absolutely no idea what to bake. I flipped through my recipe books, and while nothing was really jumping out at me, I was kinda leaning towards a triple chocolate chip cookie (stay tuned, we’ll get to it eventually). But again, while chocolate chip cookies always sound good, I wasn’t really excited about them. 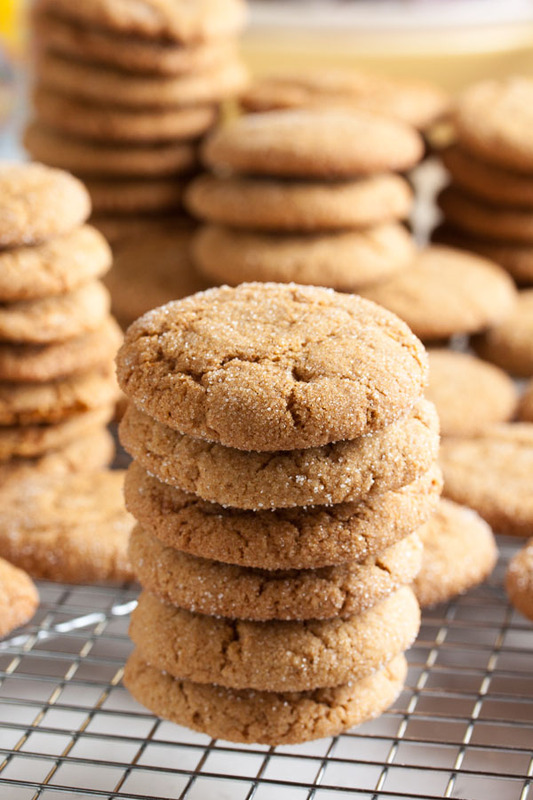 And then I saw a recipe for gingersnaps. 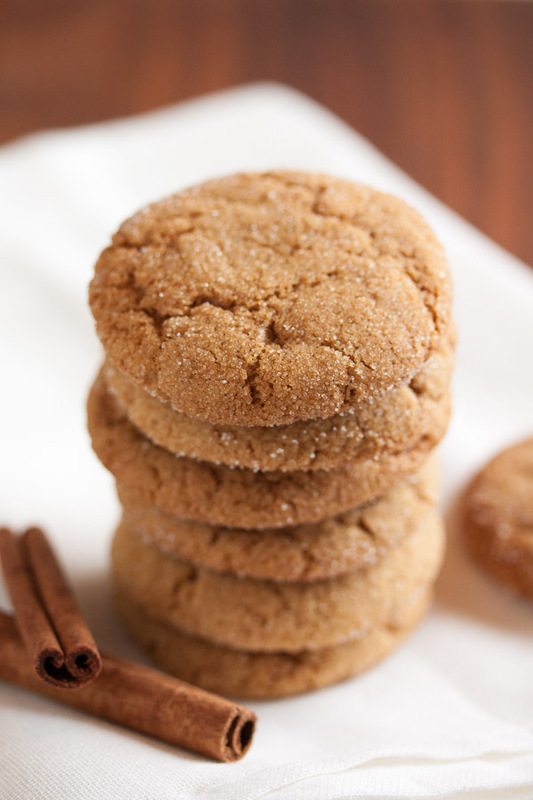 It’s definitely gingersnap weather. This is one of those cookies that I always associate with winter and Christmastime, and we’re definitely hitting winter weather here. We just had a huge rainstorm, and it’s been windy all day today. It’s this time of year that I start to crave ginger cookies. That first recipe I looked at wasn’t quite right though. 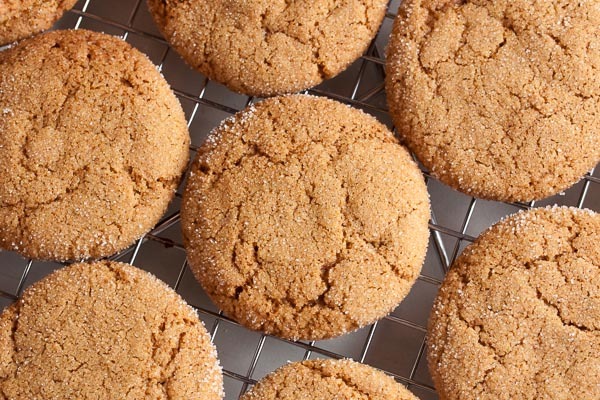 When I think of gingersnaps, I envision them with a lovely sugar coating. Right? This one didn’t have that. I’m sure I’ll still try it one day for comparison, but it’s just not what I wanted this week. It also had an ingredient that I don’t have. And that’s another thing. 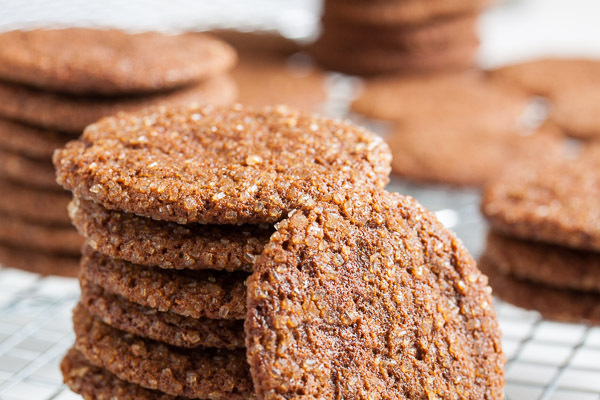 It turns out I have a lot of gingersnap recipes to choose from, and there’s quite a bit of variation. Almost all of them contain molasses, but I did see a couple without. And while some of them contain no spices other than ginger (whether it be ground, fresh, or even candied), most of them contain a variety of other spices as well (like cinnamon, cloves, and even white pepper). 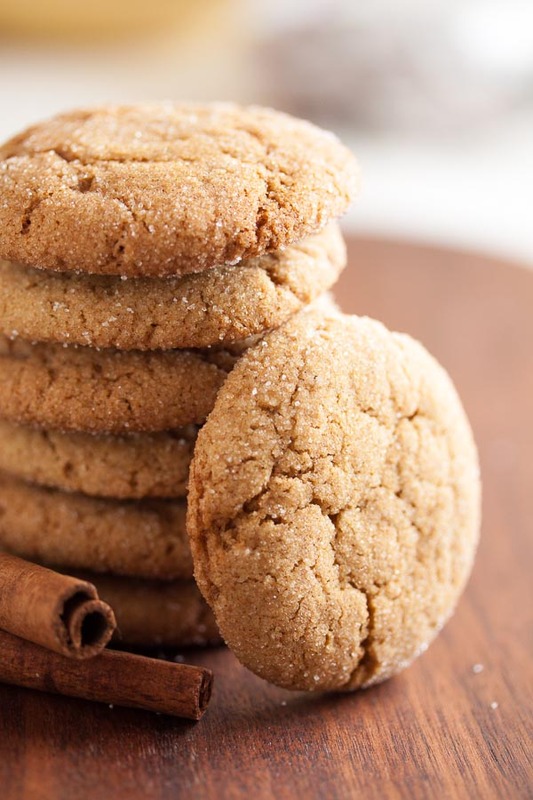 This particular recipe contains the traditional molasses and ginger, plus cinnamon and cloves. It sounded like a nice blend. But honestly, I didn’t feel like there was a lot of spice in this recipe considering there were 4 cups of flour. The resulting cookie, however, is literally bursting with flavour. 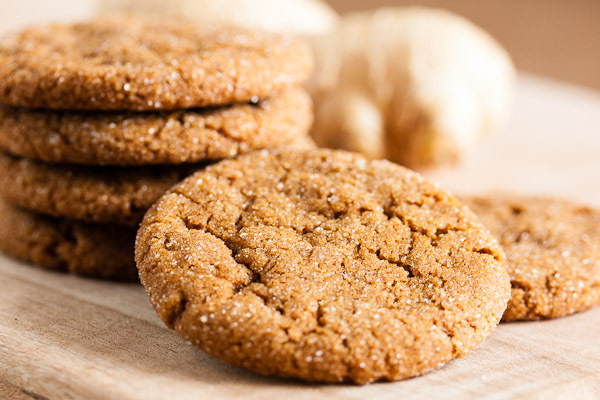 I sure hope you like ginger (I’m assuming you do since you’re looking at a recipe for gingersnaps), because this is a very ginger-y cookie. It’s also a really good cookie! I always sample the cookies I bake, but I snacked on these a lot. I thought this was going to be a ridiculously huge recipe based on the fact that it contains a whopping 3 eggs and 4 cups of flour (that’s a lot, right?). And yes, it does make a lot of cookies – 70 cookies to be exact. But that’s pretty much what I usually get. Huh. That mixing bowl looked a lot fuller than that. The cookies both spread out and puff up in the oven, and then the tops crack and they flatten out again. While I used my usual small cookie scoop, the cookies ended up a good size. And I’ll say it again – this is a really good cookie. I’ve favourited it and it’s getting added to my holiday cookie repertoire. Adapted from Butter Baked Goods by Rosie Daykin. The original name for the recipe is "The Gingerstamp" (as dubbed by the author's then two-year-old daughter – d'awwwww). The recipe says it will make 24 large cookies, but I got 70 using my usual slightly larger than tablespoon-sized scoop. In a medium bowl, whisk together the flour, baking soda, ginger, cinnamon, cloves, and salt. Set aside. In the bowl of a stand mixer fitted with the paddle attachment, beat the butter and sugar together on medium speed until light and fluffy, about 3 or 4 minutes. Scrape down the sides of the bowl and add the eggs, one at a time, beating well after each. Add the molasses and vanilla and continue beating until the mixture is smooth and light-coloured. Form the dough into small balls, about 1-1/4” diameter, and roll each in the remaining 1/2 cup of granulated sugar, coating completely. Place them onto the baking sheets about 2 inches apart to allow for spreading. Press the balls down slightly with the palm of your hand. Bake about 15 minutes, until the cookies look set and cracks have begun to form on the tops, rotating the baking sheet halfway through the baking time. Allow to cool on a wire rack for a few minutes before removing the cookies from the pan and allowing them to cool completely. For cinnamon can I use ground cinnamon or is it different? And I’ve never used molasses before, so what brand of fancy molasses did you use? They look delicious–I hope they turn out! And of course I don’t mind answering questions. I always bake with unsalted butter, but this particular recipe didn’t specify, so I’m sure it would be fine with salted as well. Lots of people just bake with whichever they have on hand and things turn out fine. Yes, it’s ground cinnamon. I’ve edited the recipe to clarify (oops). As for molasses, I’m in Canada and we have a brand called Crosby’s. They actually have some good info on their site about what the different types of molasses are used for (here). I’m sure it doesn’t matter what brand you buy, as long as you look for one labelled “fancy”. It has a lighter, sweeter molasses flavour than “blackstrap” or “cooking” molasses. Good luck! 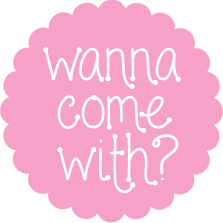 Don’t hesitate to ask any more questions, and let me know how they turn out!